Johnny Otis, now billed as the Godfather of Rhythm and Blues, was born in Vallejo, California, on Dec. 28, 1921, to Greek immigrant parents, Alexander and Irene Veliotes. By 1940, the big band jazz of Count Basie and Duke Ellington had inspired him to start learning drums, later progressing to piano and vibes. In 1946 he switched from a small boogie-blues outfit to a 16-piece jazz-swing band, signed a contract with Excelsior Records and scored his first hit, `Harlem Nocturne'. The band took off on a nationwide tour with Louis Jordan, Nat 'King' Cole and the Inkspots. They were later to record with such jazz greats as Lester Young, Illinois Jacquet and Jimmy Rushing. In 1948, Otis opened the Barrelhouse Club in Los Angeles, thus launching the very first nightspot to feature R&B music exclusively. While at the Barrelhouse, he discovered 13-year-old Little Esther (Philips). Throughout 1950, the pair cut numerous hits for Savoy records, usually billed as Little Esther with Johnny Otis and the Robins (whowere another Otis find). Their first recording, 'Double Crossing Blues', was a No. 1 R&B seller throughout the nation. This was followed by `Mistrustin' Blues', 'Wedding Boogie' and Deceivin' Blues'. At about the same time, Otis saw the potential of a tour-ing R&B review, and so 'The Johnny Otis R&B Caravan' took to the road — again the first of its kind. The package featured several Otis discoveries, including Big Mama Thornton, who was later to cut the original version of Leiber and Stoller's 'Hound Dog,' with Otis in accompaniment. Even with lengthy tours to contend with, Otis found time to search out new talent. While in Detroit in 1951, he discovered Jackie Wilson, Little Willie John and Hank Ballard. A few years later the legendary Johnny Ace joined the Otis package, and quickly became the star of the show. Otis went on to arrange and produce most of Ace's record-ings for the Texas-based Duke-Peacock label, including his smash hit of 1954, 'Pledging My Love'. Little Richard, Etta James, Charles Brown, Johnny 'Guitar' Watson and Sugar-cane Harris are just a few of the other artists he has been associated with over the years. 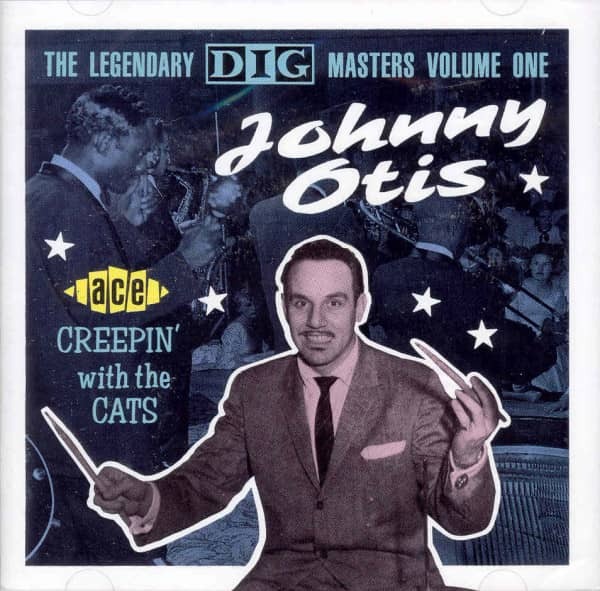 As the Fifties progressed, Otis became more and more aware of the changing public taste in R&B, notably with the introduction of rock'n'roll styles into the music. By 1957 he had signed a contract with Capitol records in LA, and later that year cut 'Ma (He's Makin' Eyes At Me)', sung by Marie Adams & The Three Tons Of Joy. Shortly after he recorded what was to become his best remembered hit, 'Willie And The Hand Jive'. It was a novelty rock song aimed straight at the teenage market, and the Top Ten, that exploited to the full the now famous 'Bo Diddley' beat. Whether the arrangement was inspired Diddley is open to debate, although Otis insists that he first played by this rhythm — know as 'shave-and-a-haircut, six-bits' — during the early Forties. The song was later covered in Britain by Cliff Richard. Otis spent most of the Sixties working in a producer-arranger capacity, until 1968 when he and his son, Shuggie, collaborated on a progressive album called Cold Shot. It was a surprise hit and led to a producer-recording contract with Columbia-Epic. By 1970, however, Otis had decided to re-form his original touring show of the Fifties, and has since played a string of successful concert dates throughout America and Europe. Customer evaluation for "Creepin' With The Cats"